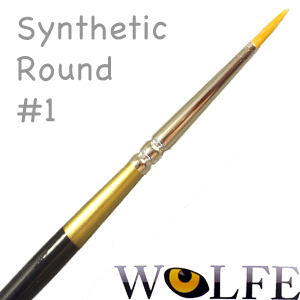 New Wolfe Synthetic Brushes Now Available! 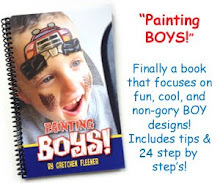 Okay, so I promised you a few more new products this week and here they are! 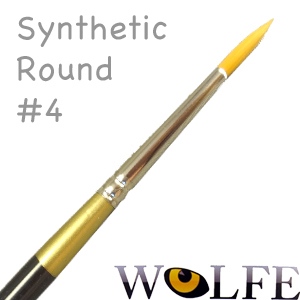 I've added three new brush sizes from Wolfe...number 1, number 4, and number 8 round brushes, which fill in some of the gaps of the current sizes we carry. I love to use a combination of both sable and synthetic brushes. Sable brushes are made of the highest quality bristles, which last a very long time. 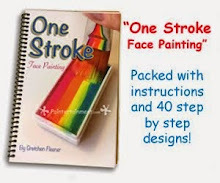 They also hold a lot of paint, so you will find that you don't have to load your brush as often. 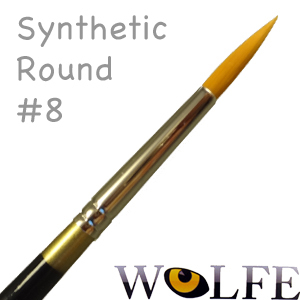 Synthetic bristles, while they may not hold as much paint as sable, hold their shape really well. 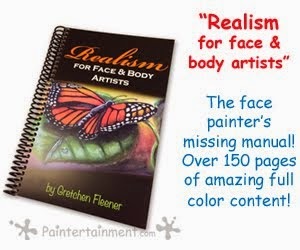 This makes them great for detail work and at times when you need to rely on consistency in your line weights. Do you have a brush in your kit that you just can't live without? I'd love to hear about it! 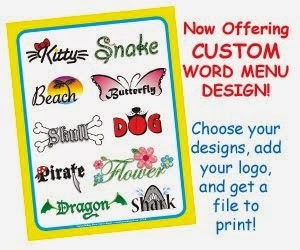 I am notorious for adding whole new products to my website simply because one customer requested it! 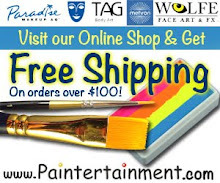 Wolfe Products Now Available on Paintertainment.com! We now have Wolfe products in stock and available on the website! 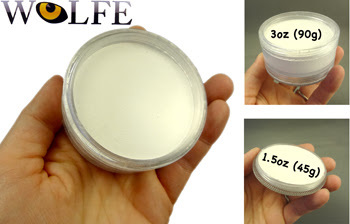 Paintertainment now carries the infamous and elusive Wolfe black and white Hydrocolor makeup in two sizes, 1.5 oz (45g) and 3 oz (90g). Currently we are only stocking black and white, but plan to take on the rest of the rainbow in the coming year! 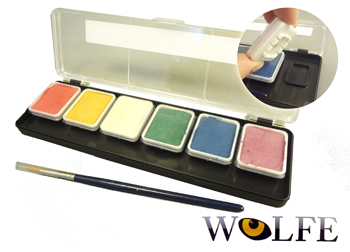 Wolfe paint containers come threaded so they can stack and screw together. This is a view of the bottom of the container, with the bottom cap removed to expose the threads. 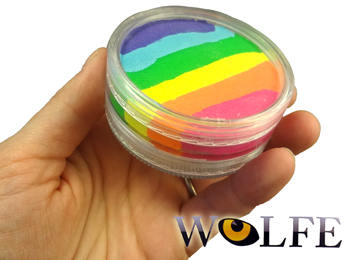 We also now stock the two Wolfe rainbow cakes, in "essential" and "neon!" Of course, we couldn't just stop there! 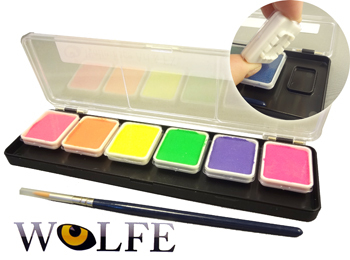 We're also now carrying several of the Wolfe "Appetizer" palettes, including the 6 color neon palette, the 6 color metallix palette, and a 12 color combination of the those two. All of these palettes come with brushes as well, and each color can be replaced when empty! We are not yet carrying all of the refills, but hope to soon! 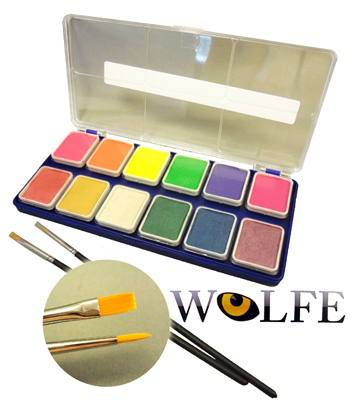 The 12 color palette includes both a round and a flat brush, and the 6 color palettes come with one round brush. More new Wolfe products will be posted up on the site in the next day or two, as I get a chance to photograph everything and update the site! Practice Heads & Pencil Sharpeners Now Available! 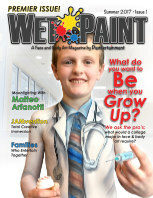 I'm excited to announce that the Paintertainment shop is now carrying two more Mehron products! Have you run out of willing models to practice your designs on? 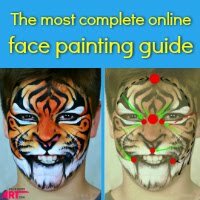 Looking for a way to perfect your designs on a face that won't budge no matter how long you take? You're in luck! 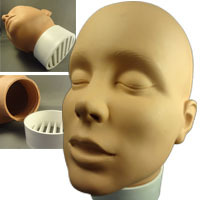 We are now carrying Mehron Practice Heads! For just $36.00 you can have a perfectly still and silent model available 24/7. Who knows, maybe your current "subject" would even be willing to buy it for you so they can go do something else! 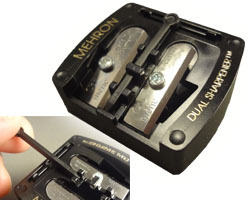 If you're a fan of the Mehron Pro Pencils like I am, you'll be happy to know that we are not carrying the Mehron Pro Pencil Dual Sharpeners for $5. Each sharpener has two blades, designed to perfectly form a rounded tip with minimal waste. They even come with a little pick that attaches to the sharpener, for removing debris from the blades. 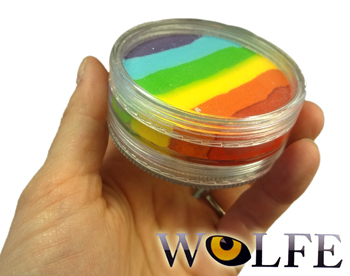 Stay tuned, folks, as I am in the process of bringing on Wolfe FX as a new vendor on the site! We'll soon be carrying their highly sought after black and white, as well as an array of other fabulous goodies from their product line. I'll let you know when I have them available! Until then, happy painting!